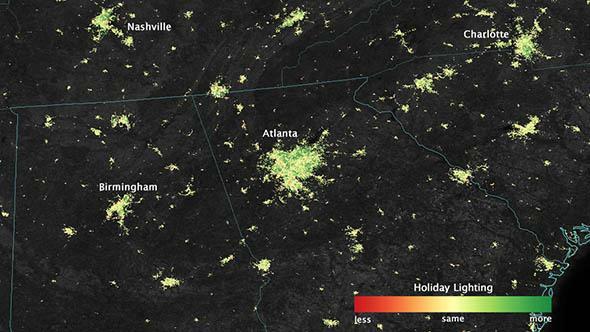 Christmas and Ramadan lights from space: A NASA-NOAA satellite Suomi sees holiday brightening. 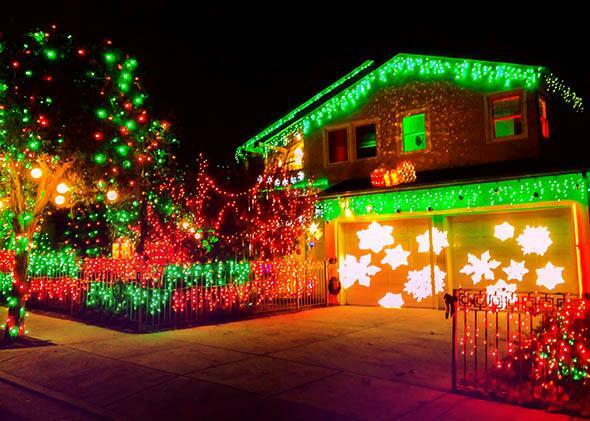 Christmas decorations are visible from space. An energy-usage nightmare in Santa Monica, California. 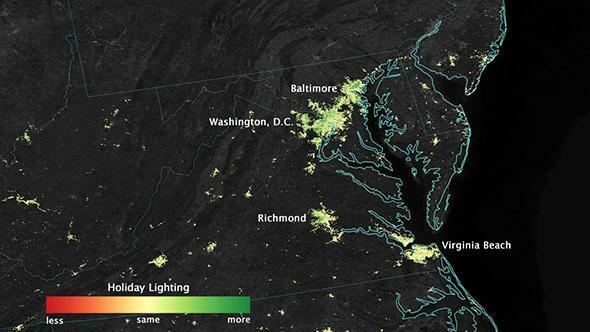 Satellite observations show that, starting the day after Thanksgiving and continuing through New Year’s Day, suburbs around major cities in the United States are lit up … well, like a Christmas tree. All those glowing Santas and sparkling snowflakes and blinking light–draped eaves are visible from space. The Suomi satellite carries an instrument designed to measure nighttime lights as a way to track energy use. It’s sensitive enough that it was able to detect a 20–30 percent increase in brightening in the urban cores of 70 major U.S. cities during the Christmas season and a 30–50 percent increase in the suburbs. Quantifying your neighbors’ aggressively merry decor is not why NASA and the National Oceanic and Atmospheric Administration mission launched Suomi into space. The finding, announced Tuesday at the American Geophysical Union meeting in San Francisco, grew out of what originally appeared to be a measurement error. In 2012, scientists looking at some early data from the satellite noticed an odd brightening in light detected in Cairo at night. They analyzed a 36-month set of observations and figured out that the brightening occurred in many cities in the Middle East and lasted about a month. It was synchronized to the holy month of Ramadan, when people fast during the day and feast at sundown. 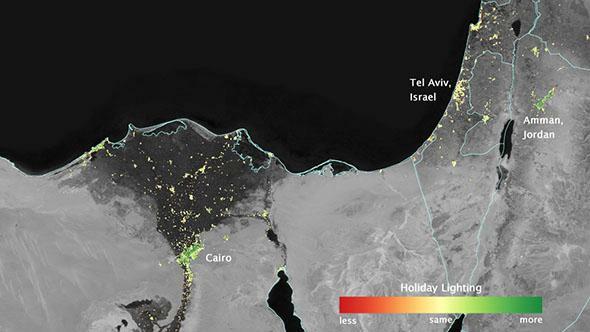 In these satellite images, yellow patches represent areas with relatively unvarying seasonal light; the green patches show where light brightened by at least 30 percent either during Christmas (in Atlanta and the Washington, D.C., area) or Ramadan (in Cairo; see Tel Aviv, Israel, on the same map for a control city). The Middle East, as seen by the Suomi satellite during Ramadan. The mid-Atlantic, as seen by Suomi satellite in December. The Southeast United States, as seen by the Suomi satellite in December. Holidays sure take a lot of energy.